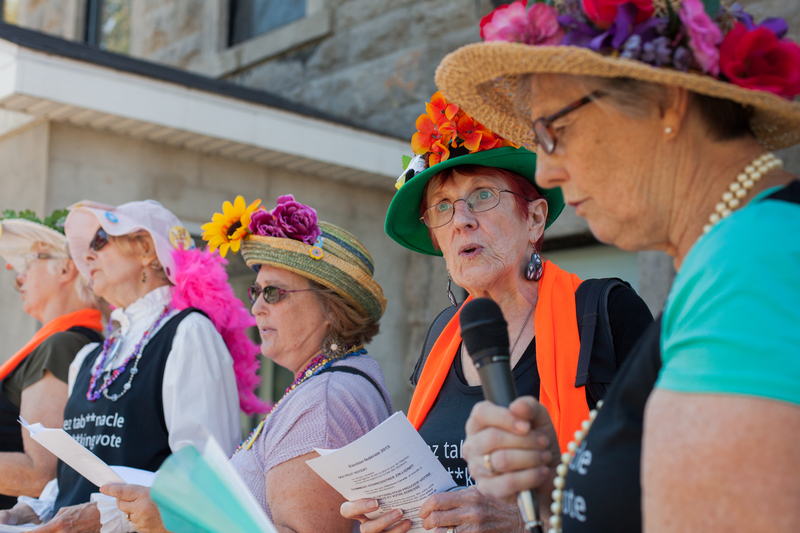 It’s just one of the lines used by the Raging Grannies of Montreal, who have made it their mission to end voter apathy among Montreal’s student population. The Montreal chapter of the national nonprofit, made up of senior women from across the country, are visiting post-secondary campuses to bring political awareness directly to students. According to Elections Canada, in the 2011 federal election, voter turnout in the 18-24 age bracket was 38.8 per cent. Combined with population statistics provided by the 2011 Federal Census, that accounts for over 1.8 million eligible voters in the 18-24 age bracket that did not cast a vote in 2011. The Grannies hope those 1.8 million votes can make a difference this October. The message appears to be resonating with some students. Elizabeta Ovolodski and Nastacia Choulgova, who both study at Vanier College, said they approve of what the Grannies are trying to do. Alan Wong, a Concordia University graduate who filmed a documentary on the Raging Grannies, hopes the movement will be at least a little effective.